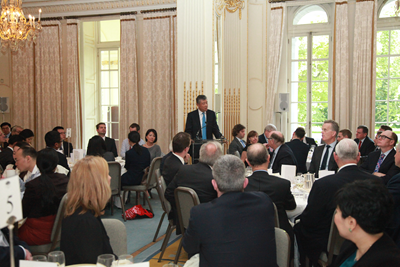 On June 1, Ambassador Liu Xiaoming attended the Luncheon of the Hong Kong Association and delivered a keynote speech. Douglas Flint, Chairman of the Hong Kong Association, Lord Wilson of Tillyorn, Former Governor of Hong Kong, Sir Henry Keswick, Chairman of Jardine Matheson Holdings, Barnaby Swire, Chairman of the Swire Group, Lord Sassoon, Chairman of China-Britain Business Council, and more than 100 prominent figures from British and Hong Kong business communities attended the luncheon. Ambassador Liu said that this year marks the 20th anniversary of Hong Kong's return to China. In the past twenty years, with the strong support of the Chinese Central Government and the concerted efforts of 1.3 billion Chinese people, Hong Kong has kept forging ahead against rain and wind and has attained remarkable achievements. The huge success of "One Country Two Systems" has been widely recognized not only in Hong Kong but also in the wider international community. Hong Kong's democratic governance has been steadily advanced, and the people of Hong Kong have enjoyed unprecedented democratic rights and greater freedom than ever before in their history. For six years, Hong Kong has topped the world's Human Freedom Index. Hong Kong has enjoyed tremendous economic prosperity and social progress, and its economic output has doubled in two decades. Hong Kong has ranked continuously as the most competitive economy in the world, and continues to maintain its global prestige as a financial, trade and shipping centre. Hong Kong has enjoyed ever-expanding ties with the world and growing global influence. Ambassador Liu also noted that what Hong Kong has achieved in the past twenty years does not come easily and deserves to be cherished. In order to reduce misunderstanding and skepticism, we should perceive the problems that Hong Kong faces now and appreciate Hong Kong's future prospects from three perspectives. First, we should look at "One Country Two Systems" from a historical perspective. It is the fundamental guarantee for Hong Kong's long term prosperity and stability and the best institutional arrangement full of vitality. It is an unprecedented political and social formula. Because there is no beaten path to follow, we have to "cross the river by feeling the stones", which means that we learn and grow at the same time as we overcome difficulties. Second, we should look at Hong Kong's return from a realist perspective. Hong Kong has returned to China. Hong Kong is China's Hong Kong. China brooks no separation and the so-called Hong Kong independence is out of the question. The Chinese Central Government fully endorses the development of Hong Kong and firmly opposed to any external interference in Hong Kong whatever the excuse. Third, we should look at Hong Kong's future from a long-term perspective. Hong Kong has the backing of its motherland and close ties with the world, which has always been Hong Kong's most outstanding geographical advantage. He believes that the growth and development of the motherland has always been a fundamental source of Hong Kong's prosperity. Hong Kong will grasp the opportunity of the Belt and Road Initiative and achieve greater development by leveraging its unique advantages in RMB internationalization, international asset management, and legal consulting. 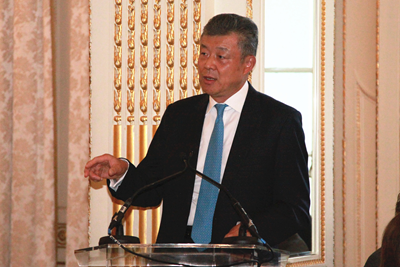 Ambassador Liu expressed his hope that the Hong Kong Association and the British business community will approach Hong Kong and China-UK relations from a long-term perspective and stay true to "three commitments". First, they should stay committed to upholding "One Country Two Systems", continue to care and support for Hong Kong's development, alert the British public against the harms of "Hong Kong independence", and encourage them to come together to maintain the foundation of Hong Kong's prosperity and stability. Second, they should stay committed to building the China-UK friendship, continue to care and support China-UK relations, and play their part in shaping the objective and fair public opinion on Hong Kong to ensure that Hong Kong will continue to be a positive factor and contribute more positive energy to China-UK relations. Third, they should stay committed to closer China-UK cooperation on the Belt and Road. Both UK and Hong Kong have a key role to play in building the Belt and Road, because they are both strong and have rich experience from past cooperation in finance, trade, shipping and law. 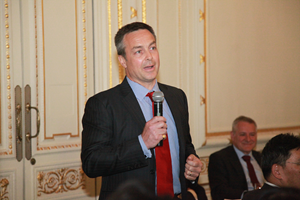 The Ambassador hopes that the UK and Hong Kong can put their strengths together and play a positive role in building the Belt and Road. 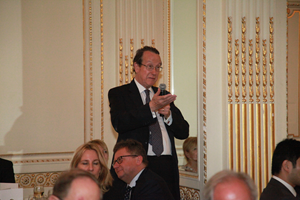 After the speech, Ambassador Liu answered questions concerning the prospects of "One Country Two Systems", UK-EU relations, China-UK tourism cooperation and international cooperation on climate change. 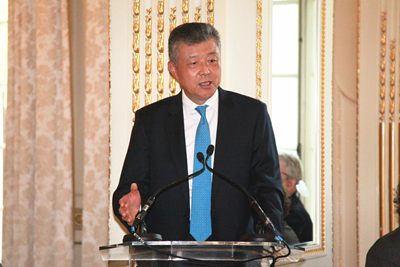 The guests acclaimed Ambassador Liu's enlightening speech as not only shedding light on the prospects of Hong Kong and China-UK relations and enhancing the understanding of and confidence in "One Country Two Systems", but also firing up the determination and enthusiasm for China-UK cooperation. Established in 1961, the Hong Kong Association has been long committed to the mutual understanding and mutually-beneficial cooperation between Hong Kong and Britain. 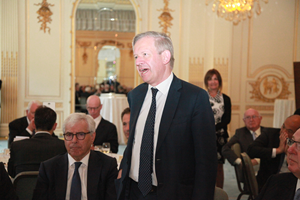 Currently, the association has nearly 120 institutional members, including most of the British enterprises in Hong Kong and the Hong Kong enterprises in Britain. 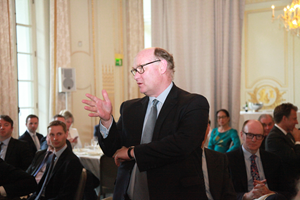 The current chairman is Douglas Flint, Chairman of HSBC Group.